Louise Erdrich's imagination courses with the mingled myths and tales of her German and Native American ancestors. Drawing from the real and the imagined and from an unshakeable sense of place and language, Erdrich creates an imaginary metropolis in the American Midwest. Author of 13 novels  among them THE BEET QUEEN, THE ANTELOPE WIFE, THE MASTER BUTCHERS SINGING CLUB and THE PLAGUE OF DOVES  as well as volumes of poetry and children's books, Erdrich also owns Birchbark Books, an independent bookstore in Minneapolis. It carries not only books she and the staff think customers will love but also showcases selected Ojibwe and other Native American art and craftworks. Her newest novel is SHADOW TAG. Louise Erdrich is the author of 13 novels as well as volumes of poetry, short stories, children's books, and a memoir of early motherhood. Her novel LOVE MEDICINE won the National Book Critics Circle Award. THE LAST REPORT ON THE MIRACLES AT LITTLE NO HORSE was a finalist for the National Book Award. Most recently, THE PLAGUE OF DOVES won the Anisfield-Wolf Book Award and was a finalist for the Pulitzer Prize. Louise Erdrich lives in Minnesota and is the owner of Birchbark Books, an independent bookstore. Louise Erdrich was born in 1954, the oldest of seven children, and raised in Wahpeton, North Dakota, where her Ojibwa-French mother and German-American father taught at a Bureau of Indian Affairs School. She did not leave the Red River Valley region until 1972, when she entered Dartmouth College in Hanover, New Hampshire. During and after college, Erdrich held a variety of jobs: she hoed sugar beets in Wahpeton; waitressed in Boston, Syracuse and elsewhere; worked in a state mental hospital in Vermont; taught poetry in prisons and schools in North Dakota; worked on a construction site; and edited THE CIRCLE, a Boston Indian Council newspaper. JACKLIGHT, Erdrich's first book of poems, was published in 1983, followed a year later by LOVE MEDICINE, which won the National Book Critics Circle Award and other prizes. LOVE MEDICINE eventually became the first novel in a series that would include, THE BEET QUEEN (1986), TRACKS (1988), THE BINGO PALACE (1994), TALES OF BURNING LOVE (1996), THE ANTELOPE WIFE (1998) and FOUR SOULS (2004). THE MASTER BUTCHERS SINGING CLUB was published in 2003. She has written of art, infancy, and the natural world in her first work of nonfiction, THE BLUE JAY'S DANCE (1995). Guest portrait by Robin Holland. In FACES OF AMERICA WITH HENRY LOUIS GATES, JR., the Harvard scholar turns to the latest tools of genealogy and genetics to explore the family histories of renowned Americans including Louise Erdrich. You can view her interview, and the whole series, online. We Shall Remain is a multi-media project that establishes Native history as an essential part of American history. You can view the five broadcast episodes online and find a deep Web site of additional materials. Louise Erdrich keeps a blog on this site. The bookstore also has a foundation arm which is active in Native American arts and language preservation. "Beauty Stolen From Another World"
A story by Louise Erdrich from THE RED CONVERTIBLE. Louise Erdrich reading her poem on The Writer's Almanac. A large compendium of resources written and collected by the Department of English, University of Illinois at Urbana-Champaign. PBS: Do You Speak American? Louise Erdrich discusses her book THE LAST REPORT ON THE MIRACLES AT LITTLE NO HORSE. The site also hosts a number of essays and talks by other Native American authors. The official Web site of the Turtle Mountain Band of Chippewa, Belcort North Dakota has a wealth of information on the tribe past and present. The Web site for is a two-part series of documentaries that explore the challenges facing Native Americans in the 21st Century. The site has a wealth of educational resources and an interactive map of American Indian history. Renowned for her mastery of multiple genres  including thirteen novels, poetry, children's literature, and a memoir of early motherhood  Louise Erdrich discusses how her Native American heritage and unique cultural experience has impacted her life, motherhood, and work. 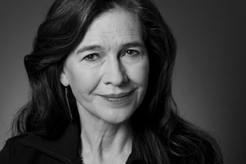 View photos of Louise Erdrich's family, life and times. More about endangered languages and the Ojibwe Vocabulary Project. Historian, international relations expert and former US Army Colonel Andrew J. Bacevich returns to the JOURNAL to discuss America's long war in Afghanistan. >>Watch a web exclusive, extended interview with Andrew Bacevich here. Explore JOURNAL coverage of Iraq and Afghanistan and the effect of war at home.